Honda GOLDWING GL1800 Dynamic Sequential led turn signal lens kit G18DT. PATHFINDERLED SEQUENTIAL DYNAMIC LED. SoCalMotoGear.com - Professional Grade Motorcycle Lighting - Plug N Play Products - "Riding at night has never been brighter!" This product Fits: [2001-2017] GL1800 MODELS ONLY - Plug N Play - Ships with Cable Harness - See part numbers below. This enhanced LED spoiler light was designed with the Rider in mind. Designed with high visibility features such as Dynamic Brake light and Dynamic Sequential turn indicators sets your gold Wing apart from stock models. When brakes are applied the Ultra Bright Dynamic LEDs activate in a rapid fire sequence which instantly alerts drivers behind you to respond quicker than they normally would. When the turn signals are activated our Sequential LEDs have a dynamic swoosh effect which resembles that of modern vehicles and increases your visibility! With the built in Dynamic Brake Light feature it eliminates the need to purchase and install a 3rd party modulator for your spoiler LED lights. This part alone costs $50 and up. Upgrade your Gold Wing to Dynamic Sequential LEDs today! Pulsates 4 times times before going solid to notify a trailing driver your vehicle is slowing or stopping. May help with reducing Rear-End Collisions. [Dynamic brake light] Instantly alerts and warns vehicles behind you to slow down when brakes are applied. This feature GREATLY ENHANCES REACTION TIME FOR DRIVERS TO SLOW DOWN when the motorcycle in front of them is braking by emitting a series of (modulating) quick flashes. This feature is found in newer modern vehicles. 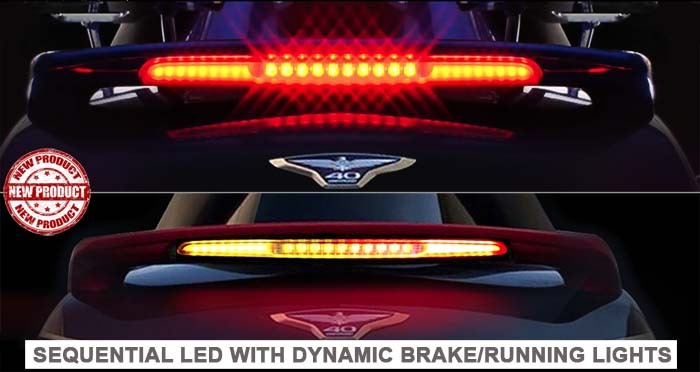 The Dynamic brake light is designed to better warn following traffic of the braking action taking place up front. This is an ADDED safety feature that all motorcycles should have. [Sequential LED] When turn signals are activated the Sequential LEDs have a dynamic “swoosh” effect which resembles that of modern vehicles and increases rider visibility! ENHANCED LED Running light makes you more visible on the road. [2001-2010] LED SPOILER LIGHT W/SEQUENTIAL/DYNAMIC BRAKE AND RUNNING LIGHTS. [2012-2017] LED SPOILER LIGHT W/SEQUENTIAL/DYNAMIC BRAKE AND RUNNING LIGHTS. Note: Plug N Play feature is for U.S. GL1800 models. NON US SPEC models may not be Plug N Play. Consult your local motorcycle technician in your country for installation options. The product will fit, just not plug n play. • 1 PATHFINDERLED Dynamic-Sequential LED SPOILER LIGHT. • 1 Plug N Play - CABLE HARNESS (specify model year when ordering) See part numbers above. International models may not be plug n play. • Product information sheet with YouTube installation video link. Similar products below include: LED Head Lights, Dynamic Sequential Front Indicator Lens and Rectangular 3in1 DRL Fog lights that will complete the look of your bike. Warranty Policy: 1 year from date of purchase. We will replace a unit under warranty due to LED failure. Warranty does not cover condensation as this could be a result of riding in different weather conditions. International customers, please contact your local dealer. We do not pay for shipping to replace an item. Shipping both ways is the responsibility of the customer. Easy install and very functional. The sequential LED tail light is a great product. It’s easy to install and provides brake light, running light and turn signals high enough for maximum visibility. A big increase in rear visibility. Well this is my 4th purchase from socallmltogear and no doubt I have had the best experience in every way. I must say Tim is one of the best guys on board and his support in every way specially after sales has been super for some one who loves overseas. This product was so easy to install and with basic tools took me 15 minutes to do everything. The LED are super amazing the sequential turn signals with the brake led are absolutely what I had expected. Thanks Tim and team for hooking me up will look forward to your future products also. Replaced the spoiler light on my 09 GL1800, I wanted something brighter and different than the one I was using, the SoCal Light fits the bill, the flashing brake light and sequential will help to get folks attention that are behind me, and the lights look good. I have the high and low headlights LED bulbs also the LED sequential front turn signals, all are great products from SoCal.